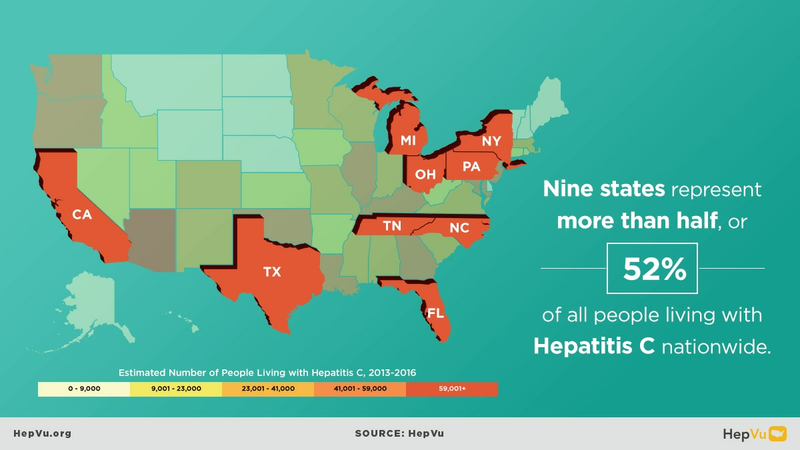 Recently, HepVu launched new, interactive maps visualizing state-level estimates of people living with the hepatitis C virus (HCV) across the United States. These maps highlight a concentration of infections in some states that have been heavily impacted by the opioid epidemic. The data also reveals an estimated 2.3 million people living with HCV infection in the United States between 2013 and 2016, with a high burden in the West and in some Appalachian states. Based on new data from Emory University, the University at Albany, and CDC, the maps are available in JAMA Network Open. Among the hidden casualties of the opioid crisis is an alarming increase in HCV infections with a 3.5-fold increase in incidence between 2010 and 2016, according to the CDC. Three-fourths of Americans living with hepatitis C are baby boomers (those born between 1945 and 1965, a priority population of the National Viral Hepatitis Action Plan). However, hepatitis C infections are increasing most rapidly among young people, primarily as a result of increased injection drug use, with the highest overall number of new infections among 20- to 29-year-olds between 2010 and 2016. "Hepatitis C and other infectious diseases are often-overlooked consequences of America's opioid crisis," said Eli Rosenberg, Ph.D., Associate Professor of Epidemiology and Biostatistics, University at Albany School of Public Health, State University of New York. "Our analysis helps to pinpoint the concentration of the disease geographically and shows the burden of hepatitis C is greater in places highly affected by the opioid epidemic." The Western United States has the highest rate of people with evidence of hepatitis C infection, with 10 of the region's 13 states having an estimated hepatitis C prevalence above the national average. Nine states (California, Florida, Michigan, New York, North Carolina, Ohio, Pennsylvania, Tennessee, and Texas) represent more than half, or 52 percent of all persons with hepatitis C nationally  and five of the nine states are in Appalachia. "One of the most critical challenges in our national response to viral hepatitis is limited data that we can use to understand and monitor the epidemic," said Patrick Sullivan, Ph.D., DVM, Professor of Epidemiology at Emory University's Rollins School of Public Health and Principal Scientist for AIDSVu. "Accurate estimates of the burden of hepatitis C infection in each state are essential to inform policy, programmatic, and resource planning for elimination strategies across the U.S. By mapping Hepatitis C in the U.S., HepVu seeks to provide a comprehensive picture of the disease's impact on states to inform researchers and public health decision-makers' prevention and care efforts." Hepatitis C prevalence is difficult to estimate and these maps use a new way to do create state-level estimates. They are produced by the Emory University Coalition for Applied Modeling for Prevention (CAMP) project with researchers from the University of Albany and developed with CDC. The new data are derived using an updated approach that includes CDC's nationally representative National Health and Nutrition Examination Survey (NHANES), vital statistics data, data on hepatitis C-related deaths and narcotic overdose deaths, as well as estimated number of hepatitis C infections among populations not included in NHANES, including incarcerated, unsheltered homeless, and nursing home resident populations. For more information on the data methods, please visit HepVu.org. Access the interactive maps here.